Check out the marker arrows that we'll be using at the A3VE. They'll be colour coded for each day. The oval ones are to indicate that you should proceed straight on. We'll also be using some generic ones for 'wrong way', 'danger', etc. Still plenty of time to enter, see you there! After much discussion and collaboration, Motorcycling Australia (MA) advises that the 2019 Australian Four Day Enduro (A4DE) has been officially cancelled. The Motorcycling New South Wales (MNSW) Enduro Committee and Far South Coast Motorcycle Club have confirmed that due to government approval delays surrounding the environment in which the 41st edition was to be held, the postponement of the event has officially been changed to cancellation. Upholding Australia?s undisputed Enduro talent internationally, this new two-day AORC event will support in fostering the growth of Off-Road competitors across the nation. MA apologises for the disappointing update to a much-anticipated world-class event and appreciates the inconvenience this causes to all already entered competitors. MA looks forward to seeing all competitors, fans and teams at the 42nd edition of the A4DE next year. Got your A3VE entry in yet? Don?t worry, there?s still plenty of time to get yourself a position on the start line of the first edition of the Australian Three Day Vintage Enduro. But be warned - We have brought the closing date for entries forward by a week from 17 May to 10 May 2019. This has been done to ease administrative pressure and free up time for us to take care of crucial tasks in the week leading up to the event. Entries have been strong, but we?d really like to see some women enter this event, as there is a dedicated class (VW). Some more entries in the pre-1976 (V1) class would be nice too. If you?re not riding we could definitely use a hand, especially in the week leading up to the start. Contact Peter Drakeford on 0422 299 003 if you can help. Just a note to let members know what we get up to with their funds outside of the usual running expenses etc. Recently we had one of our founding members Steve Juzva suffer a major brain aneurism which has left him incapacitated down his left side. His wife Raenor was distressed enough without having to deal with farm/house/horse issues and so at least 50 friends/VERi members rallied over a few weekends to clean up the outside surrounds. This included Lee Hodges doing tractor slashing, and Woody from the Tolmie Beards fitted a new reverse air con unit over a couple of weekends, which was paid for by VERi. Juz has always prodded me into action with all his 'good ideas' and his usual greeting 'you outta bed yet?' Ironically, now he's stuck in rehab trying to get his body moving again. I knew we would always support him and so I guess we (the committee) thought you guys wouldn't mind if we made Raenor's life a little easier. Duncan Wise is not an actual member of VERi, but that hasn't stopped him from working and supporting us in the running of Harrow. Duncan has never had a harsh word for anyone and the fact that he sacrifices 10 days of earning capacity to see the event go well every year is really appreciated. Duncan has been through a divorce and if that wasn't hard enough his boy Will had a triple brain aneurism and been in hospital for a year. As a consequence, VERi donated (yep, here we -the committee- go again) $1000 to the GoFundMe target of $10,000 for Will's rehabilitation. He rang me and was quite emotional about our generosity. We supported Lauchie Turner in his time of need after his accident, and the club always put into the town of Harrow. There have been numerous donations to other charities and community bodies over the years as well. Now I realise the committee only reacts to any info we get, but we need to support members who fall on hard times or need a leg up. In all of the conversations I've had with past Presidents, committee and ordinary members, no one has demurred on a donation. This I believe makes VERi the successful organisation it is. I'm proud to be the secretary of such a generous group – in time and money. Donnie Hansen Riding School on Friday! We are very pleased to announce that Donnie "Holeshot" Hansen will be conducting a riding school on the Friday. This will be a once in a lifetime opportunity for riders in Australia to attend a riding school run by Donnie. He has trained over 15,000 students at his Donnie Hansen Motocross Academy in the USA since commencing his academy in 1983. He is one of the most respected and professional motocross coaches in the USA. Donnie will tailor the class to the participants on the day and will be accepting all levels of riders. Most of all, the class will be kept very small (approximately 15 riders only) so that everyone can get his personal attention. The class will run for approximately four hours and the cost will be $200 per student. You will have the exclusive use of the natural terrain track for the class. Anyone interested in signing up for the class must of course have also entered for VMX Magazine Classic Dirt 15. Please reserve your spot by emailing ken@vmxmag.com.au and it will be first in first served. We are expecting the class to fill up quickly so please reserve a spot now. This is a fantastic opportunity to be coached by one of the best! For more event details on VMX Magazine Classic Dirt15, please click here. Donnie "Holeshot" Hansen will be our special guest! Yes, Donnie Hansen will be at the event all day Friday, Saturday and Sunday and he can't wait to meet everyone. It's Donnie's first ever trip to Australia and he's sure to get a warm welcome. Donnie will be doing some laps on Saturday and Sunday and everyone will have loads of opportunities to have a chat with him and hear some of his stories. He's a super friendly and very casual guy. Just to refresh your memory on some of Donnie's achievements, he was a factory Honda rider from 1980 through 1982, after claiming the title of AMA Rookie of the Year in 1979 and after winning many Pro and amateur National titles from 1977 through 1980. In 1981, Donnie was part of the USA Team that claimed the very first victory for USA in the MXdN, winning both the Trophee and the Motocross des Nations in 1981, along with fellow USA tem members Chuck Sun, Danny LaPorte and Johnny O'Mara. Please note that the Three Bridges Vinduro that was scheduled for 31 March 2016 has been cancelled due to extreme weather. VERi apologises for any inconvenience. A new version of the A3VE entry form is now available. It's been updated to reflect the fact that the early bird rates have now expired. Still plenty of time to enter. You don't want to miss the first ever Australian 3 day vinduro, do you?! Check out the entries to the A3VE so far. there is still plenty of time to enter, so don't miss out! "I just ride as fast as I can each day, as long as I'm not late right?" Wrong! You get penalised for being late AND being early. Your number is what's referred to as your 'minute'. 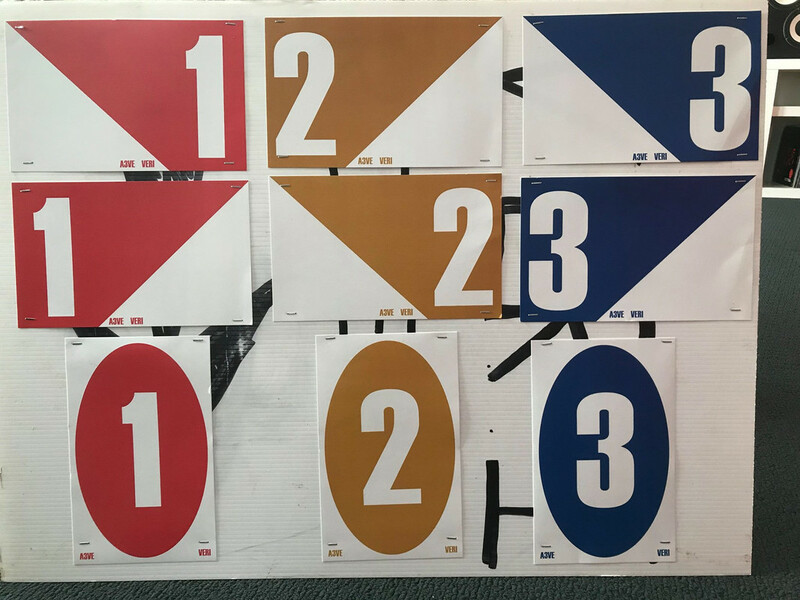 Riders will be sent away three per minute, numbered 1A/1B/1C and so on.The aim is to go through the check points when the number displayed on the flip cards matches your number. Let's say that you leave on minute 15, arrive at the check point and the flip card says 16, then you have that minute added to your overall time. You've gained a 60 second (60 point penalty). Also, you will be 'moved' to minute 16 for the rest of the day, and this will be your new minute. You revert back to your assigned minute at the start of the following day. If you leave on minute 15, and arrive at the check and the flip card says 10, then you are early. The smart play would be to wait about until your minute (15) comes up before checking in. If you don't, you'll get 5 minutes (300 points/seconds) added to your overall time. So, being exactly on time is the aim; being late or early is equally bad. The only exception is when on the special tests, where you go as fast as you can. But getting great special test times can be undermined by poor adherence to your allocated minute. "How do I 'hour out?'" If you end up being a total of 60 mins late over the course of a day you are out. And, if you somehow manage to be a total of 60 mins early during the day (almost impossible) you are also out. "Can I make up late time penalties, by being early later on (or vice versa)?" No. The objective is to stick to your minute. Once you've accumulated penalties for being late or early they can't be undone by doing the opposite later on. "Will riders have an idea of what the time frames are for each loop?" Yes. An itinerary will be available at the event outlining the loops for each day, and the time that's been allotted for them. A watch might come in handy if you want to monitor your own progress. A trip meter might also come in handy for keeping an eye on how far along your are in terms of distance. Early bird entries for the first A3VE close tomorrow - Friday 8 March 2019. Entries can be sent via email up until midnight, and postal entries that are postmarked 8 March will also be accepted. Don't miss out on this great offer! The clause in the Supplementary Regulations that refers to chain guides that refers to "no gap between the rear sprocket and the chain guide", has caused some confusion. Hopefully the images below help to explain. the chain meets the sprocket on the underside of the swingarm. This is a non-compliant arrangement. This gap needs to be covered. UK import Tim Embleton raved about the 2018 Blackwood Vinduro course, which features as the first loop of the upcoming A3VE. "I didn't know forest like this existed here! This is amazing! The variety of the terrain exceeded my expectations. Great trails, well marked too. I can't wait for the A3VE." Don't miss the ride of the year, and get your entries in before March 8 to catch the Early Bird discount. The 2019 OzVMX Resto Expo is on in less than two weeks. It's held at Dargle, Lower Portland which is only 20 mins drive from Windsor outside Sydney. This is is a family-friendly weekend for lovers of old dirt bikes in a relaxed and beautiful country setting. Several VERi members have attended past events and can attest to what a terrific weekend it is. More information is available on the OzVMX website. Peter Drakeford, A3VE Clerk of Course met Robin Holmes, Senior Officer Forest Management and Roading, Midlands District DELWP last Monday to clarify the four loops to be used. In driving around to inspect the tracks, only one was re-routed, and other grey areas resolved. Robin has now given DELWP approval for the use of the four loops. This has given the event a unique character as riders will not be repeating loops but using different ones each on the first two days and running two loops in reverse on day three. The next job is to accurately map, measure and time the loops with allowance for the special tests on the route. Enduro legend Geoff Ballard has entered the A3VE and when he heard of the set- up his reply was ?Unreal!? Don't forget that there is classes for over 60 year olds in the V2, V3 & V4 divisions of the A3VE. No doubt these will be just as competitive as the other age classes! We hope that as many more "experienced" riders as possible will take part in this event. VMX Magazine is now accepting rider registration online for their flagship event Classic Dirt 15. To register, go direct to the event registration here. The A3VE overview page has been amended to reflect recent updates and to clarify some points of interest. Work is coming along nicely with most of the four loops more or less mapped out. All loops are being put together specifically for vintage bikes, with interesting trails that won't be too difficult. At this stage we anticipate the longest loop will be approx 66 km in length. There will be at least one special test per loop, and a fuel dump will stationed at one of these. The longest distance to ride between fuel supplies will be about 44 km. Please note that it's worth getting entries in early to take advantage of the early-bird fee, plus work areas are being allocated by order of entry (see A3VE update #2 below). Competitors at the A3VE will have access to 3m x 3m work space on the Blackwood oval. There is a limited amount of these, so they are subject to availability. A maximum of three riders can use one space. These spaces will be allocated to riders who have entered and paid the entry fee. Early entries will secure riders better positions (closer to the entrance/exit). No cars are allowed on the oval, all equipment, tools, fuel containers and quick shades must be carried in by hand or trolley. Please see the map below for lay out of work area, parc ferme and start area. As with all aspects of the A3VE, details are subject to change. VERi salutes Toby Price who has piloted his KTM to victory in the 2019 Dakar Rally despite a serious wrist injury. We also acknowledge all of the participants who managed to finish this gruelling and legendary event. Read more about Price's outstanding win. The Supplementary Regulations, entry form, indemnity form, UVP form, and a really cool promo video are now available on this website. Go to the new A3VE section. Don't forget to check back for updates. Happy New Year to everyone from VERi. Thanks to all the riders, committee members, volunteers and vintage dirt bike fans who helped make 2018 a successful year for the club. The highlight of this year was definitely the 10th anniversary of the iconic Harrow Vinduro, and it will be back for its eleventh edition in 2019. VERi is also really excited about the Australian Three Day Vintage Enduro (A3VE) in May 2019. Permanent bragging rights are included with the entry fee - "Yeah, I rode the FIRST EVER A3VE in '19..."
We hope to see as many of you as possible at our events in the new year! Information about the upcoming Australian 3 day Vintage Enduro (A3VE) taking place in May 2019 is available via a detailed announcement on the home page of this site. Keep checking back here and on our Facebook page/group for updates. Thanks to the members who have replied to the original email thus far. Also thanks to those members who have let us know they didn't get the email on the first mail out. It should be in your inboxes now. * Off the Hume Freeway into Enis Road a few km out of Tallarook. * Approx 10km to left at Landscape road. * Briefing at 8.30am, riding starts at 9am. * Free camping on Saturday night. Please be aware that fire restrictions are already in place in this region. * Reduced entry fee of $60 plus $15 MV levy = $75. No late fee, but $20 extra for non-members. Entry will be at the event only. * Registered bikes only as we'll be using bush tracks. The final event for 2018 will be held at Tallarook. We apologize for the short notice, and hope as many vinduro fans as possible can make it. The 2018 Blackwood Vinduro was a great success with over 80 riders enjoying a terrific course that had a few challenging hills and deeper than expected puddles to make things really interesting! Thanks to everyone who made it possible, including: Peter Drakeford, David White, 'Jimbo' Laidler, Barb Goddard, George Goddard, Rachelle Wilkinson, Wayne Ballinger, Greg Hodges, Dave Warburton, Karen Flowers, Paul Kalika, Serge Coffa, DELWP, Geoff Davis, John McClean, Jennifer McClean, Clint Stretton, Tony Bellette, Kristen Cahill, John 'Tex' O'Brien, and anyone else we?ve forgotten. A special mention must go to the Blackwood Hotel for making everyone who dropped in for a drink or meal feel so welcome. We hope that the two injured riders heal quickly, and that any broken down bikes are repaired swiftly! VERi also asks that in future riders pre-enter our events wherever possible. The event in the Otways scheduled in November has been cancelled due to unforeseen administrative issues. VERi is working on finding a replacement venue/event, so stay tuned for further announcements. The VERi AGM was conducted on Saturday 20 October at Blackwood. A new Treasurer, Karen Flowers, was elected, and VERi welcomes her into the new role. Karen has already been a valuable helper, and many riders would have met her when signing in at events. We are sure she'll be an integral part of the VERi committee. The club extends its heartfelt gratitude to Barb Goddard, who as the previous Treasurer has done a tireless and outstanding job. The other four elected positions are unchanged: Jim Laidler - President, Peter Drakeford - Secretary, Greg Gunn - Vice President, and John O'Brien - Communications Manager. Delegate positions also remain unchanged. A point was made at the AGM of acknowledging the hard work put in by so many people to make VERi such a success. We can always use more volunteers to perform tasks at our events though! The 2018 Blackwood Vinduro was a great success with over 80 entrants enjoying a challenging but enjoyable course, in perfect weather. The VERi AGM was conducted on Saturday night, with the committee mostly remaining the same, aside from the election of a new treasurer. For members, the VERi AGM will take place at the Blackwood hall from 5.30pm. Please note that online entry for this event has now closed. All is not lost though - you can still enter at the event ($10 late fee applies). Also, the Saturday evening meal has been cancelled. Anyone who pre-paid will be refunded at the event. The Blackwood Hotel has meals available, so no need for those staying on Saturday night to go hungry! There is also the nearby Greendale Pub. Speaking of food, we've been advised that a coffee/food van will be operating in front of the Blackwood Hotel on Sunday morning. They do fresh coffee, hot chocolate, cold drinks, egg n' bacon (and other) toasties and a variety of other breakfast/morning tea items. They have advised us they'll operate longer than their normal hours to cater for us! Please support them. VERi motorcycle eligibility update - No minibikes! Minibikes such as the Honda XR100, Kawasaki KD80, Yamaha MX80, etcetera cannot be ridden at VERi events. Entries for the 2018 Blackwood Vinduro will be open very soon. Entry fee is $85 (includes $15 MV levy). Non members pay additional $20. The course will be about 50 kms in length. Some challenging terrain in there, but also fire trails so you can get your breath. This is always a popular event for VERi, and this year should be no exception. It's a great chance to sample some local trails ahead of next year's multi day competitive event. Accommodation will be available in the form of cabins with bunks, at a cost of $15 per person. This will be organised separately to the event entry. All will be revealed soon! All bikes being ridden at this vinduro must be registered, and riders must have a motorcycle licence. All bikes must be in a safe condition, and not too noisy. Attention VERi member, 2 years ago it was decided to administer Club Permit Renewals via the Clubs P.O Box. The reason for this was that people were having to chase around for signatures or forgetting to get them signed, which resulted in people failing to renew in time and losing their permit. Now we have a database that is a fail-safe and is monitored constantly, ensuring no permit will expire due to poor records management. If you have a Permit that has your own Postal Address, you must attend Vic Roads and change the "postal address only? to the Clubs P.O Box below. What this means is that when you receive your renewal, it will come already signed by the club ready to take to VicRoads to pay. No more sending off in the mail and awaiting return. If for any Reason your permit does not arrive from Vic Roads it will be highlighted on the Database, so you will never have a permit in jeopardy. This is "Mandatory for all Permit Holders? and is a club requirement, failure to adhere could result in the club revoking your permit. If you are unsure of the process feel free to contact me with any questions. More details about VERi AGM and Blackwood Vinduro coming soon! The VERi committee is meeting tomorrow (12 September) to finalise some details about the upcoming AGM, and our next event. Stay tuned for announcement(s) soon. After a successful launch of the new Gas Gas enduro range last year, the prestigious dirt-bike brand takes another step forward in the evolution of enduro motorcycles with the launch of the new 2019 EC and XC models. The evolution of the range of Gas Gas enduro motorcycles has managed to adapt like no other to the demands of the toughest of discipline, growing until it has become the best version of itself, a true dirt-bike symbol. A versatile, powerful, resistant all-terrain machine designed to meet the needs of today?s enduro rider, whatever their level. The updated livery includes a special new graphic design, keeping red as the emblematic colour of the brand and introducing new black and white strokes. For pricing and expected arrival for the EC and XC range, please see below. Did you happen to find a black Shoei helmet with a distinctive red and white design at the 2018 Harrow Vinduro? If so, the owner is looking for it! Over the past ten years the Harrow township has been the recipient of the largess of an unlikely source – motorcyclists. Over the past two years alone the Vintage Enduro Riders Inc. (VERi) have donated $9530 to associated local organisations. This year with the outstanding assistance of WURTH, Exit Brewing and Wimmera Motorcycles as well as the generosity of members bidding for front start numbers 1A, 1B and 1C, the auction raised near $3000 which the club matched. The estimated amount of donations over the past ten years has been in the region of $20,000. This year, Gregg Gunn (Vice President), Peter Drakeford (Secretary and founder of the event with landowner Lauchie Turner) and club member Colin Harper presented the group cheque to Ann Vaughn and Ron Penrose on behalf of the four local organisations. What Harrow offered was a location to ride off road through some of the most scenic country in the west. What came with this country was a group of people that couldn't do more to help put their town on the map and smooth the way for our event – the Harrow Vinduro. VERi have run a multitude of events across Victoria over the years, including; Beaufort, Ballan, Blackwood, Benalla, Bonnie Doon, Broadford, Ruffy, Three Bridges, Stratford, Yarram, Castella, Hopetoun and Tallarook. But our biggest has always been at Harrow. The attraction is actually it's greatest drawback – distance. Harrow is so far from ?anywhere? that once you're in town you make the most of it. The true grit award goes to the NSW crew travelling 1200ks, who discovered the Harrow Vinduro on its third running and have been a huge help in setting out the extended course. Over the years, organisations benefiting directly through donations from VERi have been the Bush Nursing, The Johnny Mullagh Reserve Committee, the Memorial Hall Committee, and Visitors Center, the Tennis Club, the Harrow Development and Promotion Association and indirectly from patronage on this peak weekend: the Hermitage Hotel, the Museum, the Café and Garage. This year with the death of local dynamo Bruce Caulfield a new recipient is the Horseman's Challenge organisation. As ever, the last weekend in July is set in stone as the vintage enduro scene's highlight of the year. Its reputation has crept into all corners of the off-road motorcycling scene as a ?must do? event. Now that the cockatoos have stopped screeching at the intruders, silence had descended on the town, but the club is planning already for the next year to be bigger and better. Left to right: VERi VP Greg Gunn, Lauchie Turner, VERi Sec Peter Drakeford, Ann from the Bush Nurses, Andrew from the Horsemens Challenge, Bill from the Hall Committee, Marge from the HDPA. The next VERi event will be at Blackwood on Sunday 21 October. All bikes will need to be registered and riders must hold a valid licence. There will be accommodation available on the Saturday night, we will provide more information once we have finalised all of the details. Please note that the VERi AGM will be held on the Saturday evening before (20 October) in Blackwood. Meeting time and venue will be announced soon. Not only have the Odd Bods picked up the team prize at this year's Harrow Vinduro, they've put together a detailed report of the event, and their travels, with photos. The club is thrilled with the successful running of the tenth anniversary of the Harrow Vinduro. With 217 entries, it was by any measure a terrific weekend, and a fitting way to mark this milestone. Obviously, an event of this scale is only made possible by the hard work of a large amount of people and organisations. We've attempted to name them below. All the riders and friends/families who attended, Peter Drakeford, Stephen Baker, Rob Shoemark, Dennis Myers, the NSW crew who helped set out the course, Andrea King, Karen Flowers, the Hermitage Hotel, Greg Gunn, Jimbo Laidler, Barb Goddard, George Goddard, Lauchie Turner, John Liddell, John Howden, Mick Pettifer, St Johns ambulance, Rachelle Wilkinson, John Ball and his father in law Barry, Chris Bullen, Colin Harper, Kurt Goodman, Geoff Davis, Serge Coffa, Chris Ross, John 'Tex' O'Brien, Randall and the cafe staff, David White, Paul Penrose, Dean Caulfield, all of the property owners, the sweep riders, the local Victoria Policeman, VicRoads, the people and business owners of Harrow, those who travelled vast distances to participate, all the contributors to the souvenir booklet, and anyone else we've forgotten. Our thoughts are with the four riders who were injured in separate incidents over the weekend, we hope you mend quickly! And a special mention for our sponsors: Wurth, Wimmera Motorcycle Company, and Exit Brewing. Odd Bods take the team prize at 2018 Harrow Vinduro! The team prize at the 2018 Harrow Vinduro was won by Team Odd Bods from Queensland (Bill Linagh, Richard Dyke and Steve Martin). They travelled far to take part, rode with enthusiasm, and even helped tidy up. Oh, and they wore suits and took a candelabra to the Saturday night dinner! Thanks to all of the other teams that took part: B1B2B3, Wurth, Handley, Vinduro Penrite Team, ACT UP, Misfits, Fishers & Shooters, Heaney, FBI, Creighton Crusaders, Gippy Boys, Team Sober, Sic Wog Machine, DVMCC, AMTRA, Dirty Bastards, Trents, Team Ag, 3 Bucks Short, Witch-er-way, Green & Gold, Dandenong MCC, Manly Warringa MCC, Husky NSW, Bus Boyz 1, Bus Boyz 2, SCAR, Colin's Crew, The Fermiodds, Graham's racing, Tolmie Beards, XL Boys, and Wandi Nuts. Please note that the Bonnie Doon Vinduro scheduled for 29-30 September has been cancelled due to circumstances beyond the club's control. Stay tuned for details of a replacement event, including VERi AGM, as soon as we can arrange something. VERi apologises for any inconvenience. How did I become Involved with the Harrow Vinduro? I was involved with the Classic Scramble Club at Harrow for a few years, and a chance meeting with Peter Drakeford, led to a discussion outside the Harrow Hotel, with Peter, Bruce Caulfield and myself. Peter expressed his interest in establishing a Vinduro Event at Harrow, utilising the hills, trees, rocks, creeks and bog holes, encompassing the spectacular Scenery. All participants would camp at Johnny Mullaugh Rec Reserve, and it would be the start and finish post as well. We were interested, Bruce on checkpoint duty, myself on an ATV, towing home broken down bikes from the Unforgiving terrain, and that proved to be a full-time job in the early years. Peter had a plan of 30 riders in the first event, with increasing numbers each year after that. We had our doubts, but he proved us wrong and delivered. The inaugural event happened, Bruce & I weren?t entirely sure of our duties, but it evolved. My first job was to deliver Bruce on the ATV, to an inaccessible checkpoint, defined only by a dead kangaroo on the fence, that proved harder than planned and the first few riders came through with no one manning the checkpoint. Broken down bikes everywhere, I preceded the long journey back to parc ferme, towing them individually. The event evolved next year to 50 riders, then 70, then 90, then the magical 100 barrier was broken. More ATVs were required to tow back bikes, and more staff for checkpoints, a fuel stop, and the list goes on. As the years advanced the standard of bikes improved, and it was only the unlucky that required a tow. Rain hampered some years, making a tougher event, and scared a few away, but those who remained, ATVs included, became more resilient. Then the unthinkable happened, we lost the use of the Lachie Turner?s Farm, Harrow thought the event was lost, but with some quick thinking, more farm land was found West of town, and the event evolved again into a longer trail of treacherous terrain. From all the participants I meet each year, Harrow has become the Event you have to do, the longest, hardest, endurance test of the Vinduro calendar, where the locals greet you each year as long-lost friends. Harrow and surrounds look forward to the Event each year, and the characters that it brings to the area. It is with great sadness, as I write this, that we mourn the loss of our dear friend, and dedicated supporter, Bruce Caulfield. The passing of this colourful character, from the event will be largely felt, and I am sure he will be watching over the 10th Harrow Vinduro, with a sense of achievement. To Bruce, all the best bloke, thanks for the memories. Online entry closed on 20 July 2018. You can still enter at the event, print out the form on the Harrow 2018 info page, and we will have copies at Harrow too. Don't forget that camping fees will be collected on site by the local warden. Please note that the closing date for UVP submissions via VERi is tomorrow (15 July 2018). Also, all places for the Saturday night dinner have been filled. At the last count we have received 165 entries for the event thus far, with online entries closing on 20 July 2018. We are very pleased to welcome Exit Brewing aboard as a sponsor too! Motorcycling Victoria (MV) has officially launched its new website! motorcyclingvic.com.au is a one-stop shop for everything to do with motorcycle sport in Victoria. MV is inviting the entire motorcycling community to explore this brand new platform. This website has been designed with the user in mind and aims to streamline the user experience. With simplified menus, clearer and more informative content as well as overall improved functionality, this new site allows users to get information on every aspect of their motorcycling journey, fast! It is important to note that this is just the first phase on a journey to supplying more comprehensive information in the simplest way possible to our community. Unregistered vehicle permit (UVP) application form now available. VERi has been advised that we need to fill in the appropriate form for UVPs, rather than purchase the via the VicRoads website. This form (click on the link above) will be submitted by VERi to VicRoads. This form needs to be filled in and returned via email to verivinduro@gmail.com by no later than 15 July 2018. If you've already purchased a UVP, the club will provide the appropriate UVP at no additional cost. Please contact Club Secretary Peter Drakeford via email at verivinduro@gmail.com or on 0422 299 003 if you have any questions or concerns. VERi is delighted to announce that Wurth and Wimmera Motorcycle Company have come on board as sponsors for the 10th Anniversary Harrow Vinduro. The booking system is up and running for the 10th Anniversary Harrow Vinduro. It's working well, and thus far the following punters (in no particular order) have already reserved a place in history! Stephen McCrae, Rob Jackman, Ryan Dew, Dale Brake, Curtis Pullinger, Robbie Warner, Phill Glasson, Horst Lueckl, John Cahill, Chris Handley, Dave Luff, John McClean, Geoff Davis, Ashly Hicks, Johnathon Hicks, Barry Collins, Mick Payne, Sarah Roberts, Colin Jay, David Boddy, Mark Boddy, Don Britt, Allan Rich, Peter Sutcliffe & Kurt Goodman. Please note that we will be letting riders away on the Sunday in groups of three, numbered 2A, 2B, 2C* etc. Sign up a three person team if you wish. We're not doing the four person state teams this year, but if you want to name your trio after a state or territory, feel free. *Numbers 1A, 1B & 1C will be auctioned off on Saturday night! A small amount of firewood will be available, but we strongly recommend that you bring some of your own. There'll be several sweep riders on Sunday to ensure that everyone is travelling ok. It is mandatory that all riders attend the rider's briefing on Sunday morning to find out all details of the day's event, and any important updates. These guys are ready for the Yarram Vinduro! The entry form is now available for download. You can print out a copy, fill it in, and bring it along on the weekend with correct money! The Yarram Motocross complex's camping facilities include, power, water, hot showers, and toilets. There is also a shed with a camp kitchen including a BBQ and wood heater. There are also a few fire drums supplied. Gates will be open from 10am on Saturday. The motocross track will be available on Saturday afternoon for riders (and registered bikes) who have entered the event only. The total loop distance will be about 70 kms, there will also be a fuel dump around the 50 km mark. The tracks are in prime condition after the solid rain that's fallen in the area recently. Yarram is around 200 kms from Melbourne. Take the Princes Highway to Traralgon then head south via the Hyland Highway to Yarram. The South Gippsland highway from Cranbourne also runs directly to Yarram. The track is located at the end of Morris Road, off Buckley Island Road. This should be a great event, and will include some interesting riding. It must be good - a round of the VORC was held there last year. By all reports the facilities at the Yarram MX track are terrific, so camping will be a highlight of the weekend. No catering at this event, but the township of Yarram is close by and has an excellent selection of cafes, pubs etc. It's a relatively easy drive from Melbourne, with major roads making it a breeze. Local VERi members have given up their time and been working hard to come up with a ride that is sure to impress. Entry is at the event, with no late fee, so plenty of scope for a last minute decision to come for a ride! It's also a great opportunity to shake down your bike(s) before the 10th Anniversary Harrow Vinduro at the end of July. Former Dakar champion Toby Price has been crowned king of the desert, after winning a record-breaking sixth Finke Desert Race motorbikes title. More than 100 cars and 500 motorbikes raced from Alice Springs, along a rough dirt track to the small community of Apatula — formerly known as Finke — and back again over two days. The champion rider finished the gruelling 460-kilometre course in 03:55:25.1. It was a precision ride for Price, who recorded a time difference of only six seconds between his two days riding the course. He said the record-breaking title was sweeter than his previous wins. "Fingers crossed the sixth stays there for a while, if I don't come back and do it on the bikes again, I don't want anyone beating that anytime soon," Price said. However, the victory was bittersweet. Price was attempting a double-win, in both the car and motorbike divisions, but was forced to forfeit the former when his trophy truck had a mechanical failure. "It's a bummer, it would have been nice to try and go one-one with the thing," he said. "It is what it is. Nothing really should be made to go at speeds like that across that terrain. "It's understandable that things break and things happen." Hospital staff in Alice Springs were kept busy, with almost forty people presenting to the hospital with injuries. Thirty-two competitors were injured and 14 spectators suffered minor injuries. There were no life-threatening injuries, with the majority of the patients requiring treatment for joint dislocations and fractured arms or legs. Camping available at the venue, Saturday night only, $10 per person. Good facilities available on site. No catering at the event, but only a short drive to town of Yarram for food and other supplies. Bring plenty of water for the ride! No fuel dump, and no check points around the course, which is around 60 kms in length. .
Riders briefing at 8.30am, with first riders away at 9am, and last rider(s) away no later than 3pm. The next event on the VERi calendar is the Yarram Vinduro on 1 July 2018. Bikes will need to be registered for this one, and riders must have a licence. This event should especially appeal to vinduro fans in Gippsland and Eastern Victoria. The course will be a great mix of flowing trails, made up of surfaces from sandy loam to harder packed trails, all linked together to create a loop of approximately 60 kms. A large portion of the trails are not regularly ridden, therefore they create good flow and are not flogged out. The track also features short special-test style sections in the loamy areas. Another section contains slightly bermed corners which promote confidence and higher gear use! There are no areas that riders should get hooked up on, or have to push their mates out of bog holes. The flow of the track is a great precursor to build ride fitness for later VERi events such as Harrow. Thanks to all who made the 2018 Beaufort Vinduro a great success! Peter Drakeford, John & Jenny Searby, Karen Flowers, Andrea King, Colin Harper, John ?Tex? O?Brien, Adin Gillingham & Brian Bearpark @ Fulton-Hogan, Pyrenees Shire, Lou Coutts @ HVP, Anthony Salter @ DELWP, Lorraine and Trevor Thompson @ Raglan Reserve committee and local CFA, Rachelle Wilkinson, Mick Pettifer, Steve Juzva, Kristin Cahill, all the sweep riders, and anyone else we?ve forgotten. Peter Drakeford, John Searby, Colin Harper & John 'Tex' O'Brien have been working hard this week marking out the course for Sunday's Beaufort Vinduro. There will be some fantastic riding on offer, including new terrain not previously used. The total length will be a bit longer than previously estimated, closer to 110 kms! We will probably have two fuel stops along the way, so if range is an issue for your bike, bring two fuel containers. It should also be noted that we will be trialling a more streamlined marker- arrow system at Beaufort this year. This will be explained at the Riders Briefing on Sunday morning. The entry form for the 2018 Beaufort Vinduro is available to download. Print out a copy, fill in the details, and bring it with the correct money to the event. Don't forget that the $10 camping fee is per person, per night, so if you bring friends or families please be sure to cover all persons staying the night. Section 1: to the Chute Check 8 kms. (time for riders/mates to regroup, sort problems etc with a bitumen road back to the start if necessary. Section 2: HVP pines and some bush = 20 kms. Section 3: Mt Cole = 40 kms. Section 4: HVP pines and Red Hill Road home to Raglan =15 kms. Refuel will mostly likely be at Check 2 (28 kms).